For the past four days, I have played miniature golf with my eldest daughter, Sophie, three times and have gone to a driving range and putting green. Is this parenting gone wild? I am not sure. 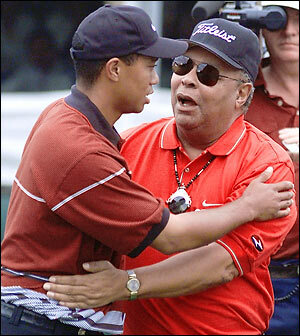 I am Earl Woods. It seems rare that parents and children have the same addiction. With heroin, for example, it seems uncommon that parents and kids share needles and are equally addicted. With this miniature golf, though, we both are addicted. For the first two days, we played Golf 'N' Stuff in Norwalk, Calif., then Boomers in Fountain Valley, Calif. Each time we played, we played 36 holes. So Sophie and I played the equivalent of a golf tournament over two days. The total par was 212. Sophie shot 73-72-70-83 for 298, and I shot 51-47-46-46 for 190 or 22-under. Yes, you read that correctly. I am reporting my putt-putt scores and am proud of them. Actually, I'm more proud because Sophie and I have found an awesome activity that we both love. "I like it so much because there are obstacles, and it's crazier than regular golf," Sophie, 6, said. Today, we played 36 holes at Mulligan Family Fun Center in Torrance, Calif. Sophie shot 65-67, while I shot 51-45 on the par-54 courses. She is showing improvement, while I am playing the same. Also, she had the only hole-in-one of the day, bringing her lifetime holes-in-one to three. Obviously, the similarities abound between Sophie and me with Tiger and Earl Woods. One difference, though, is the starting age for golf. Tiger Woods made an appearance with his dad on "The Mike Douglas Show" when he was 2 to show off his golf skills. Sophie has not even heard of "The Mike Douglas Show." Have you ever played the course at the Memphis Kiddie Park in Brooklyn, OH?